Volunteer – It Feels Great! We are looking for businesses, offices, schools, and individuals to collect donated pet food for our annual pet food drive at Camp Out for Hunger 2018. Many people don’t know that Philadoptables stocks a pet food pantry in Philadelphia for people who cannot feed their pets. Over 300 animals are helped monthly! 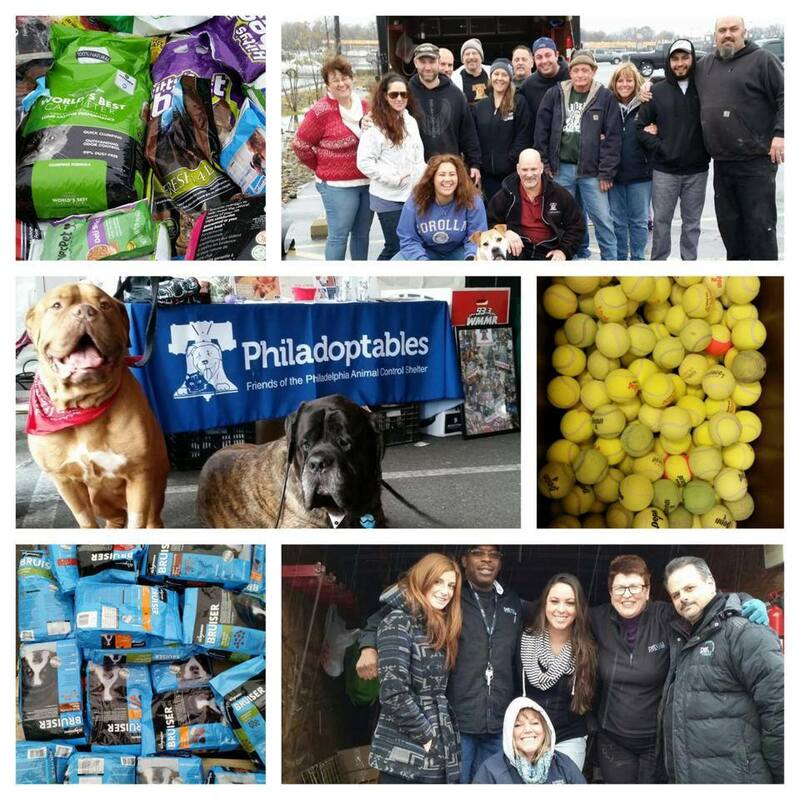 In 2010 Philadoptables was invited to collect pet food at WMMR’s The Preston & Steve Show’s Camp Out For Hunger. This event has been a food drive for people since its inception, but the show hosts were kind enough to see the effect the economy was having on animals and their families. Collected pet food goes to families in need, foster parents of Philly’s animal control shelter and rescue partners who pull animals from the Philly shelter and into their loving care. This will be our NINTH year being part of this amazing event! Philadoptables’ preparation begins a few months in advance as we start identifying locations to place collection boxes – schools, offices, stores, everywhere we can think ok! 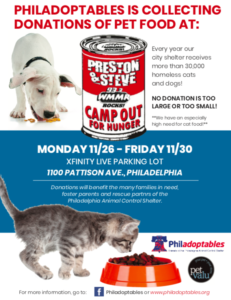 Our volunteers are amazing, and all collected food is brought to the BIG EVENT – November 26th through 30th at Xfinity Live! Email us at info@philadoptables.org if you can help feed hungry animals! Traditionally show hosts Preston and Steve live in an RV for a week while conducting live shows out of a giant tent. This week-long event is super fun but more importantly – everyone there is donating people and pet food of those in need. As we ramp up for Camp Out 2018, we need your help more than ever! We are looking for folks to help collect donated pet food – we will provide a letter of introduction, downloadable flyers, and posters. Follow us on Facebook for updates as we ramp up to the event. Your help is needed to make this year a success! Philadoptables is a 501(c) (3) nonprofit. Website (c) 2017.